Fly fish the Deschutes with confidence. Our multi-day drift boat camping trips give anglers the opportunity to fly fish for wild rainbow trout as well as a scenic 35+ mile float from Trout Creek to Maupin. 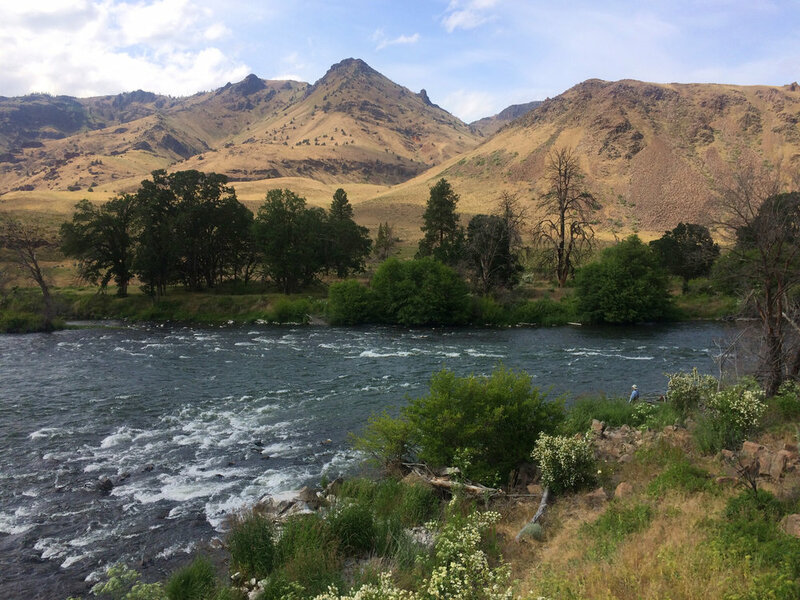 Our Deschutes River trout drift is a 35 mile multi-day fly fishing and camping float trip from Trout Creek to Maupin. Fish for native "redsides" each day and enjoy the ride in between fishing spots from the comfort and safety of a drift boat. The Deschutes changes character around every bend. Each evening you arrive at a fully prepared riverside camp. All meals and camping equipment are provided. Your guide will meet you at the boat launch at Trout Creek Campgrounds at 8:00 am the first day of your trip. large dry bags will be provided for each guest to pack their sleeping bag and clothes into. The dry bags will be loaded onto our "bag boat" and taken directly to camp. We put on waders and string up fly rods and split into groups of two. We fish two anglers per boat and guide. You will drift from one fishing spot to the next, getting out of the boat to wade and fish. The wading can be difficult on the Deschutes but we tend to fish pretty close to shore most of the time and you don't wade very deep into the river. One of the goals each day is to fish places that are within the ability and comfort zone of our anglers. Please bring your own waders and / or wading boots. Rental waders and boots can be arranged. Deschutes redsides are hearty fish and great sport on a fly rod. While not large by some standards, redsides average a girthy 14 inches. Larger fish are common. What makes redsides so special is they are all wild and native trout, free from fish hatchery interference since 1978. Their diet consists mainly of aquatic insects, dictating the flies we use and how we fish them. We typically fish dry flies and nymphs for Deschutes resides. The Deschutes gets many hatches spring through fall, including mayflies, stoneflies, and caddis flies. One of the most exciting times to fly fish the Deschutes is during the salmonfly and golden stonefly hatch in May and early June. The caddis hatch in June and July is also a lot of fun. Our goal each day is to find rising trout, but we are happy to nymph the many productive riffles and do what is necessary for successful fishing. Most fishing is done with four or five weight rods and full floating lines. Occasionally we swing flies with lightweight spey rods. Most of the time we drift down river with both nymph and dry fly rods rigged up, and opportunistically adapt our technique to each spot we fish. In addition to a well stocked fly box, trout fishing tackle includes 9' 4X leaders, 3, 4, and 5X tippet, fly floatant, split shot, and strike indicators. We are happy to provide fly rod setups, flies, and tackle for our guests. Casting and fishing instruction is always available and part of our service. We use simple and effective teaching methods and have introduced countless people to fly fishing. We also believe there is no minimum age requirement. We can tailor the experience for young anglers, keeping things light, fun, and safe. Experienced anglers will appreciate our bird dog like energy and enthusiasm, and capitalize on what we have learned over a lifetime of fishing the Deschtues. Each day begins with coffee and breakfast in camp. Around 9:00 we set out in the drift boats to float and fish a new stretch of river. We fish through the morning, hitting a number of fishy spots before meeting for lunch as a group. We usually take about an hour for lunch, then continue fishing our way down river toward our next camp. 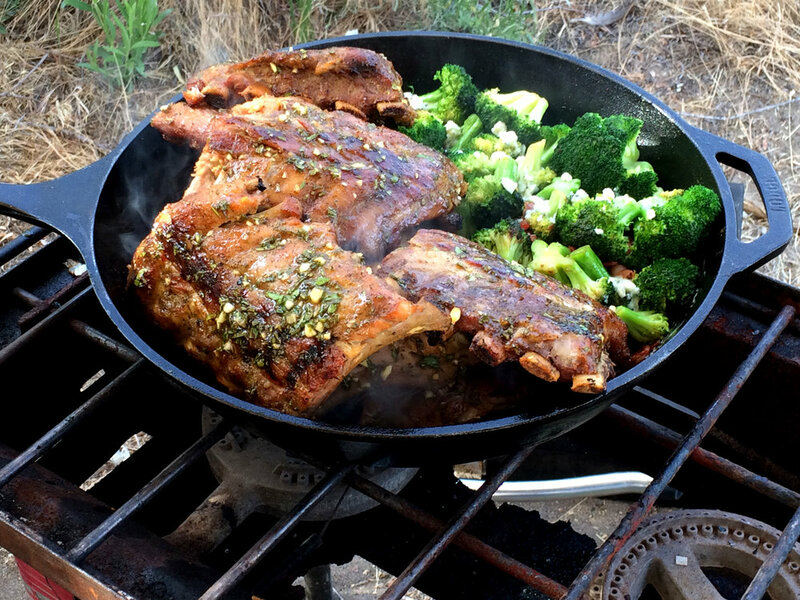 We usually arrive at camp early to mid evening for dinner. We sleep two guests per tent. Tents are over six feet tall and equipped with sturdy padded cots. We are happy to accommodate special sleeping arrangements. During spring and fall a steel framed canvas wall tent serves as the centerpiece of camp. Here we gather for meals, comradery, and occasionally to dry out waders. During the warmest months of summer we prefer to dine under an open sky. Camp trips are priced per angler, minimum four. We do have options for two anglers. You will need to have: Fishing license, Deschutes Boater Pass, waders and wading boots (studded felt sole recommended), sleeping bag and pillow. We can assist you with obtaining most of these items. Year 'round, although peak fishing is March through October. Fishing License: You will need a valid Oregon angling license (available online at https://or.outdoorcentral.us/or/license). Boater Pass: You will need a Deschutes Boater Pass, a Bureau of Land Management fee and document available at https://boaterpass.com. We are happy to purchase your boater pass on your behalf. Tribal Permit: If we put in at Warm Springs (adding an additional ten miles to the drift) each angler will need a Warm Springs Tribal Permit to access 8 miles of Indian Reservation. Daily and season / family permits are available at http://tribalpermit.com. We are happy to purchase your tribal permit on your behalf. Our Deschutes Trout Drift begins at the Trout Creek Campgrounds boat launch, located on the Lower Deschutes River about 13 miles North of Madras, Oregon. Guests arriving by plane typically fly into Portland, rent a car, and drive approx. 2 hrs 30 min to Madras and stay at a hotel the night before the trip. From Madras it is 30 min to Trout Creek Campgrounds. Nearest accommodations are in Madras, however Bend is also nearby and has a lot to offer. Pre / post trip accommodations handled independently and not included. Arrival: Fly in to PDX, rent a car, and drive to Madras, Oregon. Overnight in Madras. Accommodations handled independently and not included. Fishing Days: Meet your guide at Trout Creek Campgrounds at 8:00 am, 30 min from Madras. Three full fishing days. Departure: Half fishing day. Arrive at the take out at 1:00 - 2:00 pm. Your vehicle will be there when you arrive. Drive back to PDX. When they eat a natural six inches from your fly (five times in a row) its easy to lose your $h1+! My last few days on the Lower Deschutes were spent casting stonefly patterns under trees to trout that had full bellies and seen plenty of imitations. Currently the big bugs are spread out from the lower river down stream from Mack's Canyon all the way to Pelton Dam. Sometimes when the trout want to eat stoneflies but are too stubborn, try something totally of the wall. Maybe one of those green drakes you've been holding on to for a rainy day. The rise was splashy and bubbly, but the nose and head never broke the surface... it got me thinking about the lost art of identifying riseforms. If you know me, awesome fishing doesn't necessarily equate to lots and lots of action but rather a key moment or experience that defines the day and sometimes the trip. A few tips to help you out during the salmonfly hatch on the Lower Deschutes River. I have to admit that I am very much a dry fly type of person, and all swing when it comes to steelhead... but I also can't deny the simple pleasure of indicator fishing for trout in a heavy riffle. Here are a few photos from the past few weeks of fishing the caddis hatch on the Lower Deschutes. Hot weather, lots of bugs, and rising trout. What more do you want?! With the recent blast of heat the caddis have made their presence known to the trout. Yellow Sallies have been on the menu as well. Deschutes stonefly hatch less than a month away!